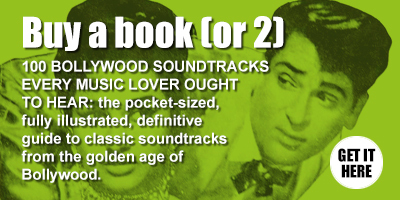 I was curious to find out if 'Parwana' would have a similar vibe to that of Madan Mohan's raunchy, mind-blowing previous effort 'Mahraja' or if it would fall into the more serene and traditional (but not necessarily less worthy) category of soundtracks I'd initially come to know him for. Closer to the former it turned out. And it's a pretty good one, although my copy is partly scratched and ruined: 'Yun Na Sharma Phailade' is marred by a couple of skips I was unable to work around whilst ripping. It's included in the download, but you might want to look for a better version elsewhere. I'll be looking for an upgrade. 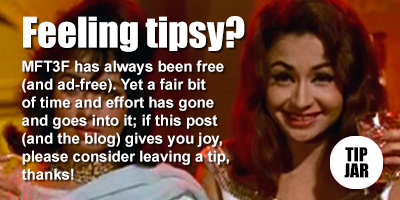 Luckily the rest sounds ok.
'Chale Ladkhada Ke' is a top cabaret number, sounding delicious and decadent. Another drunk-song? Helen looks both intoxicating and intoxicated in the clip. Predictably my favourite track here. 'Jis Din Se Main Ne Tumko Dekha Hai' is also excellent; a lovely tune wrapped in a gorgeous, almost folky arrangement. 'Simti Si Sharmai Si' is charming pop; a long intro keeps you guessing with several tempo and time-signature changes. I really love this soundtrack - still trying to find a decent copy myself (the one I have is badly beat up, but I need to play it again someday soon to check how bad it really is!) Love the mix of pop and traditional sounds - and my fave Asha/Helen cabaret number. Magical! The EP version of this soundtrack has such great sound quality compared with the LP ... a shame that the songs are badly chopped down on the 4 track EP. Wasn't aware there was an EP of this. I find they tend to have inferior sound quality to the LPs, but to be fair, my copy is a Dutch issue of dubious legality, so an Odeon original might sound better. And yeah, the truncation of tracks on EPs is really annoying. thanks fr upload. loved it.. but yu na sharma is a bit scratchy.. if possible pls look into it and reupload that number only..
You know, if you'd bothered taking two minutes to actually read the write-up before downloading, you'd have found the answer to your issue right there.